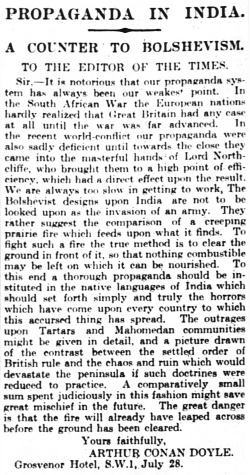 Propaganda in India is a letter written by Arthur Conan Doyle first published in The Times on 29 july 1920. See also his second letter on the same topic: Propaganda in India (14 january 1930). Sir, — It is notorious that our propaganda system has always been our weakest point. In the South African War the European nations hardly realized that Great Britain had any case at all until the war was far advanced. In the recent world-conflict our propaganda were also sadly deficient until towards the close they came into the masterful hands of Lord Northcliffe, who brought them to a high point of efficiency, which had a direct effect upon the result. We are always too slow in getting to work, The Bolshevist designs upon India are not to be looked upon as the invasion of an army. They rather suggest the comparison of a creeping prairie fire which feeds upon what it finds. To fight such a fire the true method is to clear the ground in front of it, so that nothing combustible may be left on which it can be nourished. To this end a thorough propaganda should be instituted in the native languages of India which should set forth simply and truly the horrors which have come upon every country to which this accursed thing has spread. The outrages upon Tartars and Mahomedan communities might be given in detail, and a picture drawn of the contrast between the settled order of British rule and the chaos and ruin which would devastate the peninsula if such doctrines were reduced to practice. A comparatively small sum spent judiciously in this fashion might save great mischief in the future. The great danger is that the fire will already have leaped across before the ground has been cleared. Grosvenor Hotel, S.W., July 28. This page was last edited on 18 July 2016, at 15:10.